Not that I can honestly say I've ever even realised that I knew you could even have a lunar eclipse, from 9:24pm tonight and lasting until 1:03am tomorrow morning there is a total lunar eclipse happening. 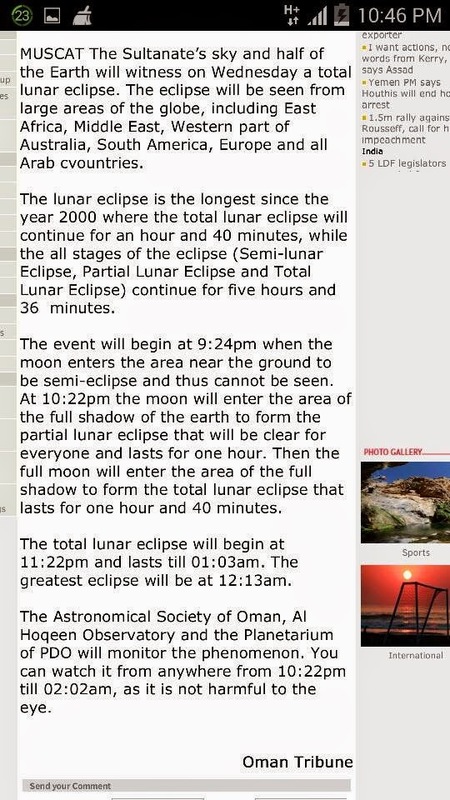 According to the Oman Tribune article, the best time to look at the exclipse will be just after midnight at 12:13am. I'll be in the land of nod. Thanks for posting this! Lunar eclipses are far more common than solar eclipses, there are quite a few happening worldwide every year. However, they often go unnoticed due to cloudy weather or new moon (or happening at an ungodly hour) but sure are as spectacular as a solar one if the moon is full, so this one tonight should be a good one! Bobbins. at least verify stuff before u post it. Google sky maps shows the moon below the horizon. do if there is a lunar eclipse its not visible from Oman. You're all absolutely right!!! There wasn't a lunar eclipse last night!!! I saw the news paper article posted by 2 different people on the popular facebook page WHMO and because the Oman Observer website is so totally crap to search, I wrongly assumed that the news was legitimate!